Glacier National Park (GNP) straddles the continental divide along Montana’s border with Canada. Ever since Al Gore’s 2006 film, “An Inconvenient Truth,” the Park has been seen as ground zero in the international battle over manmade global warming. Almost every major figure promoting apocalyptic-manmade-global-warming-by-CO2 hysteria has made a publicized visit to the Park. 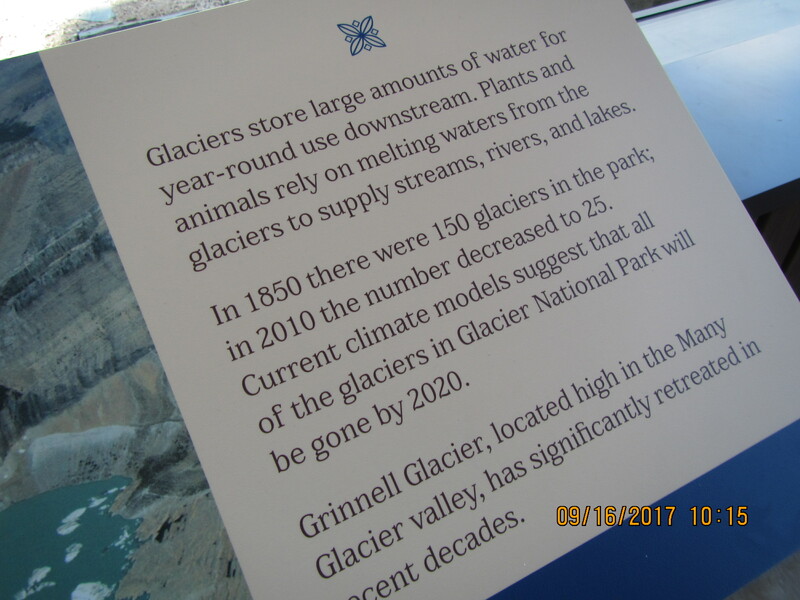 A recurring trick by climate hysterics is to show an old photograph of one of GNP’s glaciers next to a more recent photo of the same glacier showing a massive decrease in size. Often the pictures do not precisely specify what calendar dates the photos were taken on. This is significant because the melting season is quite short and rapid, and an image from August can be starkly different from an image from just weeks earlier. The average date of first freeze in East Glacier, Montana is September 13th. It is only then that one can assess whether the glaciers are getting bigger or smaller than in previous years. 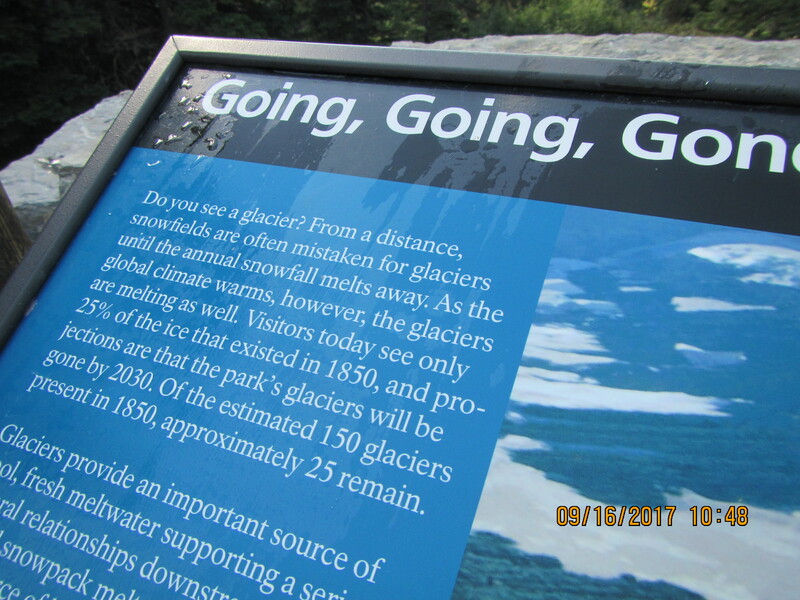 In September 2015, Lysander Spooner University launched an annual research project aimed at visiting GNP’s glaciers every year at their lowest points. 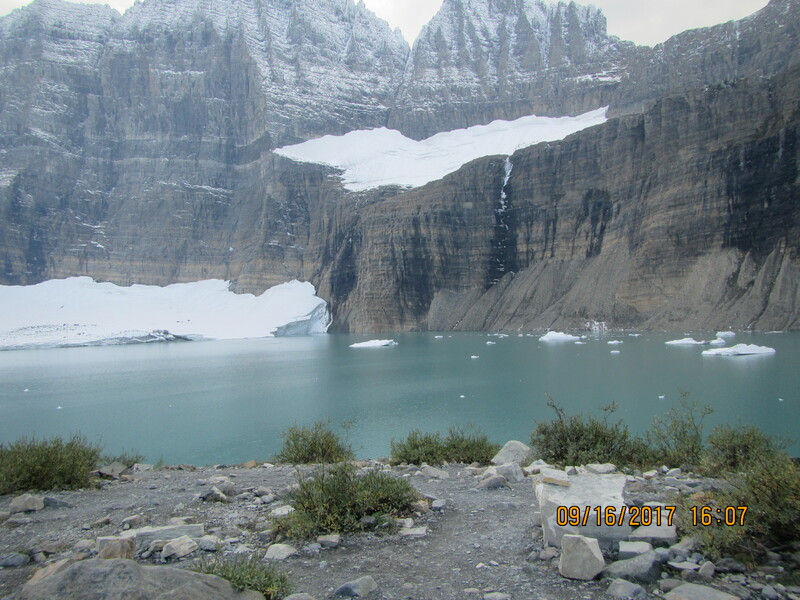 This year a small group of us opted to hike to the popular Grinnell Glacier and take a few snapshots on September 16. 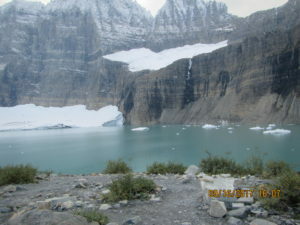 We hiked the 5.5 miles from the Many Glacier Hotel and arrived at glacier’s edge late in the afternoon. The Grinnell is perhaps the most iconic of two dozen named glaciers in the Park. Untold thousands of people have hiked to it. 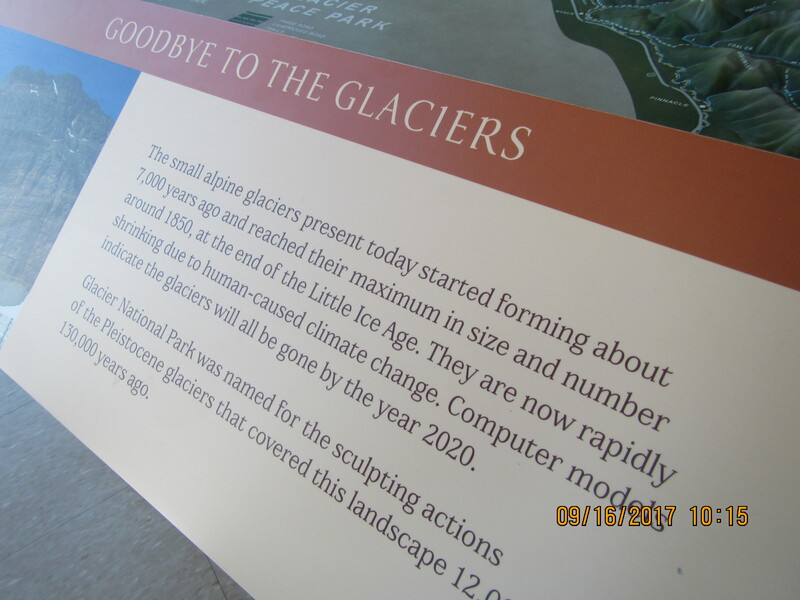 Millions more have been exposed to government imagery of the Glacier melting away. 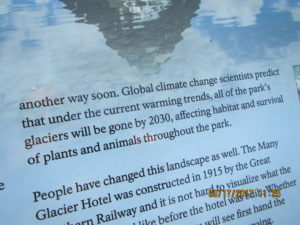 The nearby Many Glacier Hotel features pictures on its walls showing the Grinnell’s decline from the 1880s to 2008. Numerous blog posts and magazine feature stories have also featured this theme. 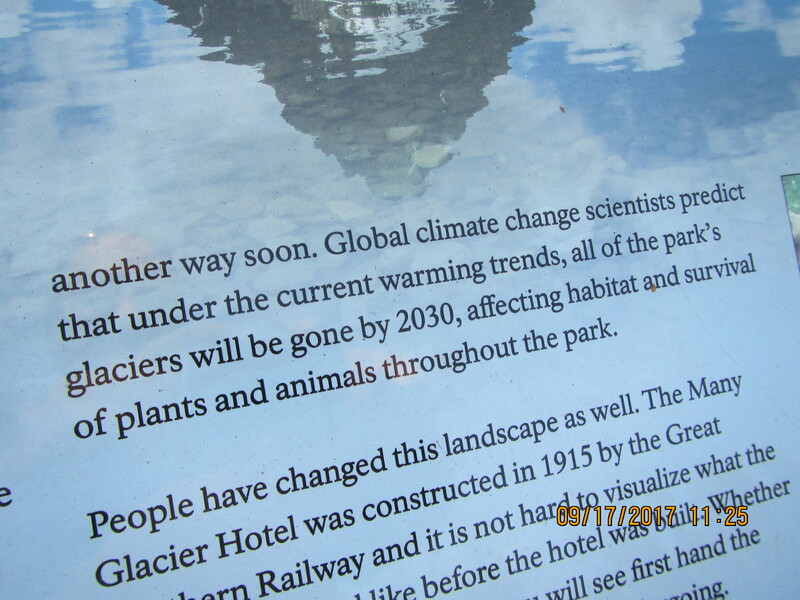 Upon our return to the Hotel after visiting the Glacier, we noticed that our brand-new photos appear to show that the Grinnell Glacier has grown slightly from the 2008 images that are displayed on the Hotel walls. There has been no reporting of this in any newspaper or broadcast that we know of. (In fact, all news coverage reports the precise opposite.) The smaller Gem Glacier—which is visible from the valley miles below—also appears to be slightly larger than it is shown in 2008 pictures on display. We did not have enough people this year to trek to other glaciers. However we will return to GNP in September 2018 for more critical glacier research. Please support our efforts if you can. Contact Lysander Spooner University President Dr. Roger I. Roots with any questions or comments. 406-224-3105 or rogerroots [at] msn.com.